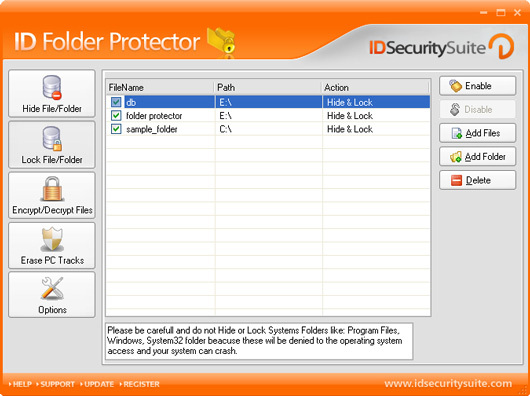 ID Folder Protector is a very easy to use program, designed to help you maintain the privacy of your personal data. It locks, hides, encrypts and protects from viruses, Trojans and spyware, files and folders you wish to keep for your viewing only. ID Folder Protector is a very easy to use program, designed to help you maintain the privacy of your personal data. It locks, hides, encrypts and protects from viruses, Trojans and spyware, files and folders you wish to keep for your viewing only. Main Features: - Locks private folders - Encrypts selected files - Hides files extremely well - Erases PC tracks - Manages the bandwidth for an application Detailed features: - ID Folder Protector is a high performance locking program, keeping your personal files out of reach from any third party. - Locks an indefinite number of files and folders. It keeps them away from other users, preserving them safe from being altered or deleted. - Hides the main application from the tray, taskbar and desktop, from start and context menu, quick launch and even from add/remove programs in the control panel. You can select or unselect this option from inside the program only. - Encrypts selected files so that the content is then modified and impossible to read by other users. It can be decrypted if the right password is introduced. You can set the number of password tries to three times with a shutdown to follow after unsuccessful attempts. - Decrypts files that have previously been encrypted. By introducing the password, you can unblock the content of the files and can preserve an encrypted sample as well. - Protects highly your encrypted files from any hacker attacks, by making them impossible to be accessed by anyone else but you. You can safely send them via e-mail without the risk of the content being corrupted. - Erases PC tracks from typed address history. You can remove items from Internet Browser and can select which files to be deleted from Browser’s Cache files. You can do the same for cookies, downloads and history of visited URL’s. - Has an easy to use, convenient graphic interface which requires minimal space on your disk to operate and run efficiently. ID Folder Protector is a high performance locking program, keeping your personal files out of reach from any third party. Locks an indefinite number of files and folders. It keeps them away from other users, preserving them safe from being altered or deleted. Hides the main application from the tray, taskbar and desktop, from start and context menu, quick launch and even from add/remove programs in the control panel. Decrypts files that have previously been encrypted. You can select or unselect this option from inside the program only. - Encrypts selected files so that the content is then modified and impossible to read by other users. It can be decrypted if the right password is introduced. You can set the number of password tries to three times with a shutdown to follow after unsuccessful attempts. - Decrypts files that have previously been encrypted. By introducing the password, you can unblock the content of the files and can preserve an encrypted sample as well. - Protects highly your encrypted files from any hacker attacks, by making them impossible to be accessed by anyone else but you. You can safely send them via e-mail without the risk of the content being corrupted. - Erases PC tracks from typed address history.